Running a retail business requires managing a host of complex processes - from ordering and receiving, to pricing and invoicing, and from selling and tracking, to shipping and servicing - plus so much more. When you move into new channels, you multiply all of those tasks by the number of channels you sell in, whether it’s 2, 3, or 10. It’s no wonder multichannel selling can be so difficult, yet selling across multiple channels increases your opportunities as well. And there are ways to simplify and streamline. 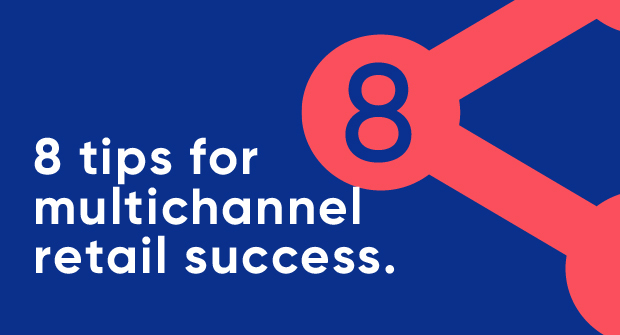 In this guide, you’ll find 8 expert tips to help you win in the world of multichannel retail. Doing business across multiple sales channels can make product management difficult. For one thing, you’re likely to offer a different subset of your products on each channel. Plus, each channel runs its own software. The only way to bridge these differences is with Stock Keeping Units (SKUs). They act as unique identifiers for the products you sell and give you a common way to refer to them, regardless of channel. Pre-allocation: With this approach, which is required by some systems, you reserve, or pre-allocate, a percentage of your inventory from each channel as a pad against double-selling. The downside is that you remove unsold products from inventory, so you can’t sell them. Quick synchronization: A better way is to choose a system that updates your inventory as quickly as possible after a sale. This keeps all inventory available for sale, but since no system can update all channels instantaneously, there’s always a small risk of double-selling. Built-in price management: Some systems include automated price management, which is especially handy on channels with price-sensitive shoppers where adjustments are made more often. Outside price management: If your system doesn’t include automated re-pricing, you can deactivate price management for that channel and delegate the responsibility to a separate price management system. Different sales channels also may need different product information, so it’s best to manage products at the channel level. eBay listings, for example, may contain much more information - even a storefront full - than Amazon listings. And ecommerce stores need extra content that the other channels don’t need to help shoppers search for and compare products. Although this channel-specific content can lead to inconsistent data, it’s generally worth it to have the information tailored to each channel’s format. You’ll find that each channel handles taxation a little bit differently. Your best bet is to make sure everything is set up properly at the sales channel level. Just enter tax-exclusive (net) prices, and then add tax based on country-specific rules. U.K. merchants: Under your VAT-based scheme, tax depends on the type of product as long as it’s being purchased from within the EU. Buyers in Australia don’t pay tax. U.S. merchants: Under your sales-tax scheme, tax is chargeable based on where you and your customer are located as long as the product is taxable. Read the retailer's guide to international trade VAT implications. Another thing that’s different on each channel is how shipment details are communicated to your customer. To keep your customer service quality up, make sure you know what to do on each one. eBay and Amazon: Since seller ratings and buyer service are monitored closely, you need to update their systems when an order is shipped so customers can be notified. Retail stores: Your stores, on the other hand, require little post-sale communication since the customer has already left with their products. (Hint: You can still send an offer later to encourage further sales). BigCommerce, Shopify and Magento: Some sales channels, like these three, email customers when a shipment is created. But, for those that don’t, you need to manage this communication yourself. Discover how to automate your customer service (including your post-sale communications). Different channels also treat partial shipments differently. Most ecommerce systems support the concept of shipments and multiple shipments for an order. And most software pushes shipment information back into the sales channel. eBay is the big exception. This channel marks orders as “shipped” only when all shipments are completed. Make sure you know which channel does what. When you venture into new sales channels, your ecommerce and accounting software won’t be enough to handle the new workload. Instead, you need to supplement that software with a multichannel retail management, or hub, system designed to handle the unique complexities of this business model. Support your ecommerce platform: When you pull sales from your ecommerce system (and any others) into the hub system where backoffice processes like order processing, inventory management, and customer service can be handled efficiently, you leave your ecommerce system to do what it does best - sales. Augment your accounting software: Hub systems provide more purchasing, order processing, and inventory management power to handle the increased load. They also send consistent, branded invoices and communications, even if you use different trade names on each channel. And they support multiple levels of permissions so your whole team can work in the system. Getting multichannel retail right can fuel big revenue and profit growth. And these tips can help you to do just that. Each one is based on our many years of retail experience and are designed to flag the differences between channels - so you can not only get it right, but get it right the first time.